Black and white negative of an aerial photograph of Whitby taken from the water tower on Euclid Street. View looking north-west shows the Ontario County House of Refuge at left. At right is St. John's Roman Catholic Church. St. John's Roman Catholic Church was built in 1902. The Ontario County House of Refuge was built between 1901-1903. 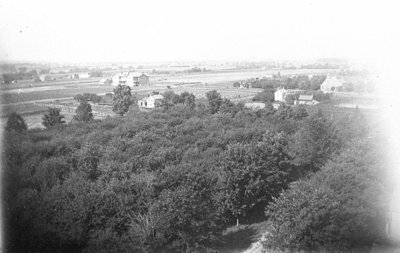 Looking North-west from Euclid Street Water Tower, July 1906, George I. Wilson, Whitby Archives, 22-000-062.